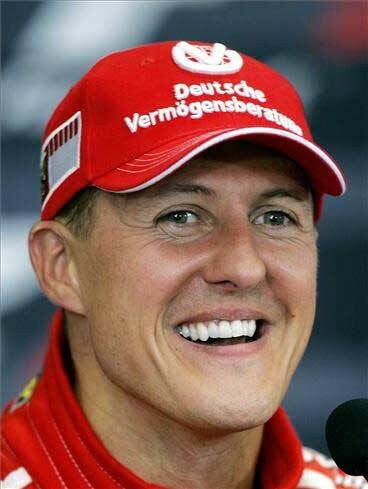 Michael Schumacher, was born in Cologne , Nordrhein-Westfalen, West Germany, January 3, 1969) is a Formula 1 racing driver from Germany. Currently, he fell race with Mercedes GP team after it was retired temporarily from 2006 to 2009. Previously he was the team Jordan, Benetton and Ferrari. His younger brother, Ralf, who is currently racing in the event the DTM with Mercedes-Benz team, also was dropped as a Formula 1 driver from 1997 to 2007 season. Schumacher's first race in Formula 1 in 1991, since then he has won 91 races and seven-time Formula 1 world champion (1994, 1995, 2000, 2001, 2002, 2003, 2004). He also holding various personal record in the arena of world champion in F1 like the most, the most wins, most pole position holder, winning the most points (with the system prior to 2010) , and the most wins in a season (13 times in the season 2004). Schumacher is one of the many legends live Formula 1 is very popular to this day. Schumacher, along with Jimmie Johnson (NASCAR), Valentino Rossi (MotoGP) and Sebastien Loeb (WRC), also widely known as one of the legends of motorsport in the early 21st century. He also shared his brother Ralf is the only brother and sister pair who successfully recorded a 1-2 victory in the race and the 2001 Canadian Grand Prix Canadian Grand Prix 2003. Outside of his own race track, Schumacher is an ambassador of UNESCO and also ambassador for road safety of drivers. He also often donate money to some charity income and humanitarian need around the world. But behind that is quite extraordinary career, Schumacher also had some controversy, such as the struggle against world champion Damon Hill in Australia GP 1994 and against Jacques Villeneuve at the 1997 European Grand Prix which led to Schumacher disqualification from the championship of the world affected. To date Schumacher holds the record as the only drivers who hit the disqualification of the world championship standings. Schumacher started his own early career of racing karts before he moved into single seater arena and then managed to win the Formula König and Formula Three. He was later hired by Mercedes-Benz sportscar to go down in the arena before being hired by the Jordan Grand Prix to race in the 1991 Belgian GP. From there he then pulled into Benetton by Flavio Briatore. 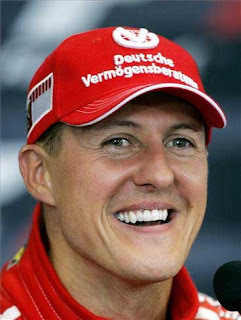 Having managed to become world champion in 1994-1995, Schumacher then move to Ferrari in 1996 and then managed to dominate F1 for five consecutive seasons from 2000-2004. He then retired from F1 at the end of the 2006 season and became a consultant for the Ferrari team. Michael Schumacher, who was born on January 3, 1969 in Cologne, Nordrhein-Westfalen, Germany, is the first of the couple's son Rolf and Elizabeth Schumacher. His father, Rolf is a go-kart track marshall disebuah in Kerpen. From this interest grew Schumacher racing against the world, and from here one day, a snot-nosed kids grow up to be one of the world's most respected figures as reflected in his entry in the order of "Top 100" by Forbes magazine twice, the order of the 15th edition of "Celebrity influential in the 20th Century "(published: 2001) and sequence-17" The Power of Celebrity 100 "(published: 2005). In 1975, the younger brother was born, later named Ralf Schumacher. At that Schumacher also likes playing football. FC Köln coincidence headquarters not far from the residence and Ralf Schumacher, so the sisters get a football lesson from the German national team goalkeeper as well as FC Koln goalkeeper at the time, Toni Schumacher. As a child, Schumacher played more as a goalkeeper in the area of ​​local football team, and then eventually he turned into a striker. Currently, he is also still playing football. Along with some professional footballers such as Ronaldo, Zinedine Zidane, Pavel Nedved and Alessandro Del Piero, Schumacher had held a charity match, the team filled with athletes like Boris Becker, Roger Federer, and Valentino Rossi. Down as coach in a charity match was Schumacher at Ferrari boss Jean Todt as team coach athletes Schumacher (with direct guidance from Juventus coach Marcello Lippi at the time), and Pele as a coach for a team that professional.Selain footballer, Schumacher and Rubens Barrichello also ever present in the 2002-03 season's Champions League final between AC Milan vs. Juventus at Old Trafford Stadium, Manchester, England. And they both support Juventus as a subsidiary of Fiat who also oversees the Ferrari team, unfortunately, lost to Juventus via penalties. At the age of 9 years, Michael started off at a local karting championship. Then at the age of 16 years, at a time when he was in high school, Schumacher often helped his brother in a racing kart. At that time, Schumacher became the mechanics of the go-kart was then ridden by adiknya.Schumi had tried attending college on the sidelines of his racing career, but his dream of becoming a scholar vanished after he decided to concentrate on the racecourse. And who would have thought that is where the future of Michael Schumacher's name will be widely known by the world. Schumacher is an animal lover. He has five dogs in her home. One of them is pick a dog, which he took from Brazil, when the course of the 1997 Brazilian GP. And now, the dog who gave his name "Flo" is still faithful to live with Schumacher in Switzerland. The name "Flo" is a play of words in German, "Flea", which means that fleas, and indeed at Flo's body when he first picked, filled with lots of ticks. Besides dogs, Schumacher also had a tortoise. The tortoise is the provision of Mika Hakkinen, who is a turtle lover. By Schumacher, turtles are then given a personal sponsor logos, Deutsche Vermogensberatung, so easy to find when he disappeared. Corrina Schumacher married in mid-1995, and has two children, Gina Maria (born 1997) and Mick (born in 1999). Previously, Corrina is a former girlfriend of Heinz-Harald Frentzen. The couple had settled in Monaco, but Schumacher prefers to alienate her family from the world of celebrity, until finally he chose to settle in Switzerland next door to Felipe Massa and Jean Alesi. For the music business, Schumacher is a fan of the band Red Hot Chili Peppers. His favorite song is "By the Way", he thought that some verses of the song's lyrics have a deep understanding of his heart. Outside of racing, Schumacher is also a motorcycle enthusiast, he's even more fun to ride when it comes from the hotel to the circuit. Close friend of the motor racing event is Michael Doohan, Valentino Rossi and Casey Stoner. In mid 2009, Schumacher nearly returned to F1 with Ferrari after Felipe mass suffered severe accident at the Hungarian GP, ​​but suffered a neck injury caused by accident while motor racing, Schumacher finally thought better to drop back in F1. Late 2009 and was widely reported Schumacher will return to race in F1 for the 2010 season with the Mercedes team. The rumors finally came true in late December 2009 when Schumacher announced that he will join Mercedes GP for three seasons (2010-2012).